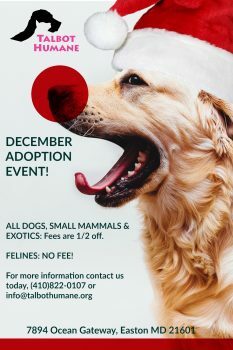 Kick of the Holidays with a Sunday afternoon Paint your Pet Party to support the animals in need! We are doing this event on the 3rd floor of our new shop- Head to Tail Thrift and Vintage, across from the Humane Society on Rt 50, Sunday, December 4th 2-4PM. The cost is $45, includes all materials. Each attendee should bring a photo printed or on your phone of the pet you would like to paint, just the face will do. It will be encircled by a holiday wreath. 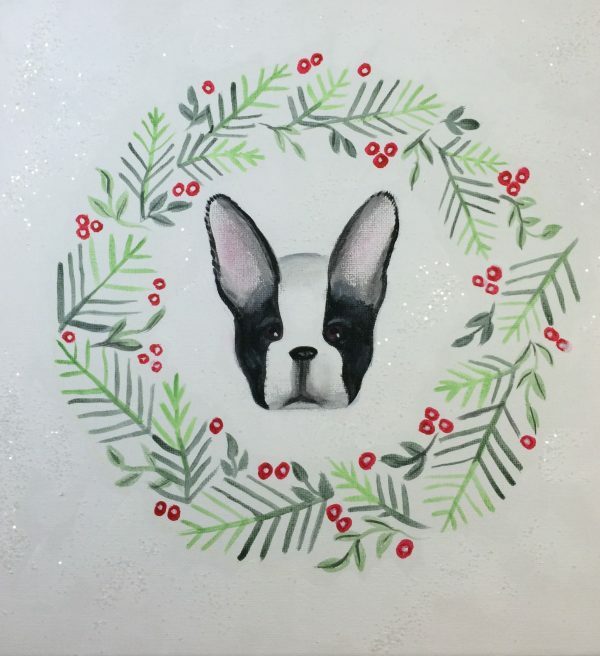 Artist Maggii Sarfaty will be helping each of us make our own holiday masterpiece of our beloved pets. We hope you can join us! Festive Fridays & Fun Events Ahead! We are so lucky to now have Head to Tail Thrift and Vintage open for business! The store not only is a form of revenue for our efforts at Talbot Humane, but, we have a new location for fun events! Get the first look and best selection of toys for holiday giving at Head to Tail Thrift & Vintage! Nov. 29~ RISE UP with a Giving Tuesday Challenge! We want 100 animal lovers to stop in the store with a $10 donation on national Giving Tuesday and two great things will happen: The Talbot Humane Board of Directors will match up to $2,000 in donations, for a possible $4,000 fundraising drive for the day! AND, how about this- the first 50 people who make a $10 donation get a FREE DRINK coupon from Rise Up Coffee Roasters. Oh my! Work ’til 5? We’ll stay open until 6 pm! Come to the store from 5-7 pm with your leashed pet and have your holidays photo taken at our annual event to benefit the animals with a $10 per pet suggested donation. You won’t believe the amazing things that have been generously donated to Head to Tail Thrift & Vintage! Waterford crystal, gold jewelry, fine art work, designer handbags and many other wonderful gift ideas! Shop with us for that special piece at an affordable price! All merchandise with something red or green on it is 50% off all day! Hunt for those colors and grab a great deal just before the holidays! Don’t panic! Let us help you find the unusual, the unexpected, the last minute gift! Never fear, there’s always something special at Head to Tail Thrift & Vintage. There’s a New Shop In Town! All to help the animals! Talbot Humane is opening an upscale thrift and vintage store, to serve as a sustainable source of funding for the work we do for shelter animals. We are counting on the generous support of community members like you to donate those gently used treasures you no longer need, which we can turn into much needed revenue! Donate those things you know you don’t need to a local shelter instead of a BIG BOX second-hand retailer. Keep your money in your community, where it can do the MOST GOOD! Bark in the Park- Goes to the… POMS! They are described by the American Kennel Club as intelligent, inquisitive, cocky, commanding and animated. Rescued Pomeranians will be the star of the show at Talbot Humane’s 7th Annual Bark in the Park festival on October 8th, when many of the more than 300 “Poms” who were saved from abuse and neglect this past spring in Wicomico County will reunite for POMapalooza! The Pomeranian Reunion, sponsored by Kevertin Pet Resort, is Talbot Humane’s chance to honor the Humane Society of Wicomico County for its outstanding rescue work and to thank the eight other animal welfare organizations that took in some of the Pomeranians, gave them medical care, grooming, socialization opportunities and then found them loving, new homes. Through the cooperation of local animal welfare groups, over 250 of the rescued Pomeranians and dozens of their puppies who were born in the shelters that took them in, have been adopted. The remaining dogs are still under medical care at the Humane Society of Wicomico, and will likely be held pending criminal charges filed against the former owners of the dogs. 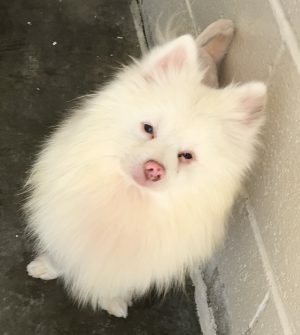 “The public was so engaged in this story and in the welfare of these Pomeranians, and so many animal welfare groups banded together to help, that we thought it would be fun to see them all back together healthy and happy with their new families,” said Patty Quimby, Talbot Humane Executive Director. Everyone who adopted one of the rescued Pomeranians from any of the shelters has been invited to join us for the reunion in the dog show ring. 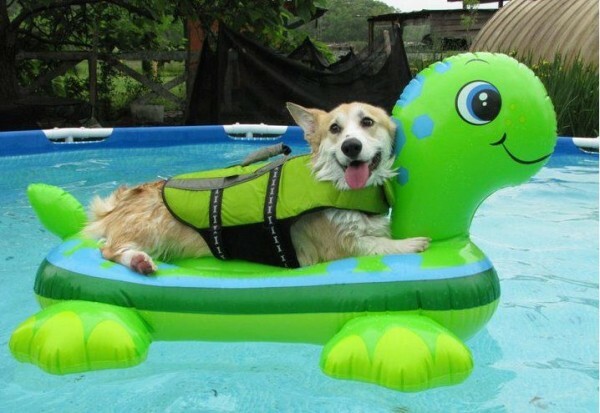 “They also will lead our annual Dog Parade, sponsored by Hair O’ The Dog Wine& Spirits,” Quimby said. While many people gave the rescued Pomeranians a place to call home, many others across the Shore donated thousands of dollars in dog food and toys, cleaning supplies and monetary contributions. Groomers donated their time and resources, shaving and bathing the terribly matted and filthy dogs, clipping nails that were much too long, and cleaning ears and eyes. In addition, many veterinarians donated much-needed medical care for the dogs, including sorely needed dental work. Also new this year is Talbot Humane’s commitment to serving food that is humanely raised and sustainability grown. Featured food vendors include the Sprout Food Truck, Rise Up Coffee, Jamie’s Catering serving pulled pork from Pop’s Old Place, Highland Creamery, and more. Talbot Humane will launch new efforts at Bark in the Park to promote local food producers who are humanely raising animals. Please plan to try what’s new on our menu this year for breakfast and/or lunch! Other festival features are: the day starts with a 5K fun run on Easton’s beautiful Rails to Trails sponsored by Tricycle and Run; the Pawrade of Adoptable Dogs from many area animal welfare organizations; The Pet Boutique, sponsored by St. Michaels Pet Supplies, featuring their stores must-have pet items; agility and other canine demonstrations; groomers from Kevertin Pet Resort; veterinarians and animal welfare groups; business and craft vendors; live music from Three Penny Opera; and a kid’s agility course. All dogs must be leashed. Admission is free to Bark in the Park, held at Idlewild Park in Easton, October 8th from 8 am-noon. 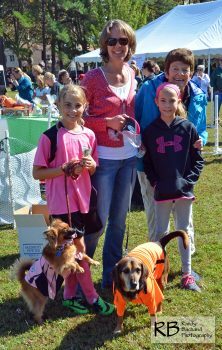 The public can register for the Dog Parade, 5K Fun Run/Walk and the Fun Dog Show online here: 7th Annual Bark in the Park. All proceeds benefit the animals and programs at Talbot Humane. Join us for a wonderful evening to support 2 great causes! 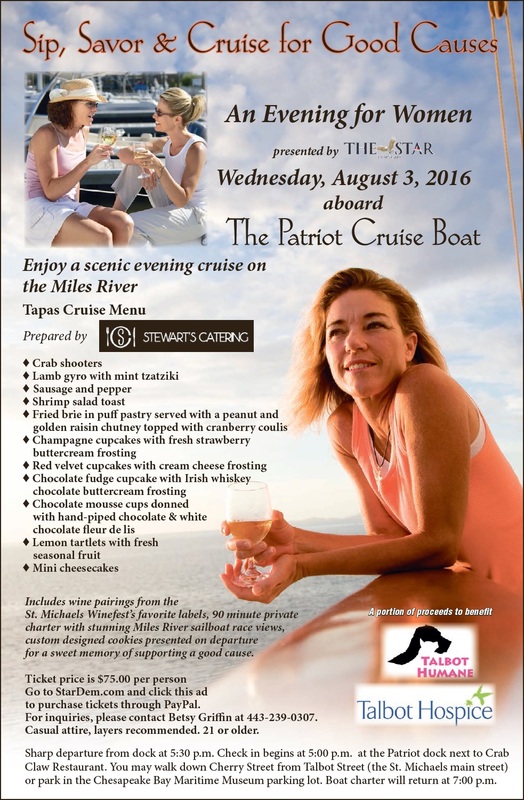 Enjoy a scenic evening cruise on The Miles River with an assortment of light and heavy hors d’oeuvres prepared by popular St. Michaels eateries. Includes wine pairings, 90 minute private charter with stunning Miles River sailboat race views, custom designed cookies presented at departure for a sweet memory of this special evening. For more information, contact Betsy Griffin at 443-239-0307. A Fascinating Read for a Great Cause! Author Gail Buchalter has written a page turner, “Friday Nigh Fighters” is a fictional tale about a forensic veterinarian and her fight for justice for those without a voice, set right here on Maryland’s Eastern Shore. Gail Buchalter is an award-winning journalist who was a staff writer for People magazine and a contributing editor at Parade magazine for 20 years, and arguably one of the longest surviving freelancers at Forbes magazine. She wrote about film, television and recording artists, sports figures and her true love – animals. Gail was born and raised in Manhattan, lived in Nashville, Los Angeles and Southampton, NY, before moving to rural Maryland, where she opened a yoga studio in 2002. A board member of the local humane society, she was also instrumental in helping create a low-cost feral cat spay/neuter organization. She has adopted and fostered numerous cats and dogs, and today lives with her three dogs and two cats on several acres in the woods. “I could not conceptualize how someone could write a fictional book about pit bull fighting that people would want to read, but Gail Buchalter nailed it! She accurately portrays the medical, forensic and legal aspects of the work through characters that are fantastic and funny – I found myself laughing out loud at times – and could not wait to learn more about them. She has created an intriguing, gritty mystery with a heartwarming story about animals and the people who work to protect them. An outstanding accomplishment!” — Melinda Merck, DVM, Owner of Veterinary Forensics Consulting, LLC, Austin, TX, who assisted with the prosecution of NFL quarterback Michael Vick. 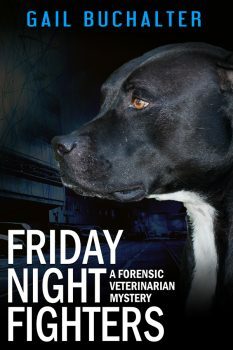 “This is a great read told from the perspective of the forensic veterinarian who has seen it all. Her voice grabs you immediately, from the description of when the doctor first meets Ella, an abused pit bull she adopts, to the emotions involved in investigating these horrid acts of cruelty and violence. There are many factual pieces woven into this gripping story. It has all the elements of a fascinating read: love, hate, crime, animals, and a heroine working for the greater good!” — Patty Crankshaw-Quimby, Executive Director Talbot Humane; President, Professional Animal Workers of Maryland, Inc.